Deutsche Bank, DB, Germany’s flagship financial institution, has announced that for the past quarter it has lost $7 billion and for the first time in half a century it will not pay the dividend on which tens of thousands of German families rely. A big part of the loss is to pay fines by European and United States courts and regulators for dishonesty in London, New York and in Germany itself. The dishonesty consisted in part in selling clients valueless bonds and paper, and in rigging interest and currency exchange rates. The latest losses follow years of criminal activities, as described by New York, London, and Berlin prosecutors, by DB among a dozen French, English, Swiss and U.S. global banks caught rigging markets. The money, the funny money, goes to directors and managers, not to shareholders much less to the tax collector. The DB announcement came a few days after Volkswagen admitted to fixing the exhaust emissions of its diesel vehicles. VW faces $20bn worth of criminal charges and trading losses. The head of VW, a 68-year-old engineer, said it was nothing to do with him. He has been replaced, taking $70mn in retirement benefits. Lufthansa allowed earlier this year one of its planes to be deliberately crashed, killing 200 passengers. VW, Deutsche Bank, and Lufthansa have represented German, European, world dependability and engineering and social responsibility. Ambitious capitalism toned down by worker and government involvement, a contrast to Anglo-American a ultranza combative corporations, ruthless but often as we see today, more open. Japan, so successful for a few decades after the War, is tight and closed and its famously turgid economy seems to reflect this. It seems to be a similar story, perhaps, in the EU. VW, DB and Lufthansa have represented, created, today’s version of the European tradition. Next door, in Switzerland, the Swiss president of FIFA, Herr Blatter, is being investigated by U.S. and Swiss law enforcement agencies as the head of a criminal organization, with its HQ in Zurich, running the world’s biggest, bar none, recreation business. Long-respected Swiss banks like UBS, Union des Banques Suisses, and Credit Suisse are in court, like Deutsche Bank, for rigging the markets and running money-laundering and tax rackets. They also face charges of rigging precious metals and money markets. Credit Suisse is raising $6bn in new capital to make up losses, as also is DB itself. Today’s shareholders are being watered down. They are losing part of their investment as well as their dividends. It is difficult to put together half a dozen names that have better represented the most reliable, responsible face of 21st Century capitalism. Everyone also knows that the European banks, led by DB and the International Monetary Fund, have lent Greece $460bn and that every last euro of this has disappeared into new accounts at the same banks. European taxpayers will pay the losses via the Brussels printing presses. To put this in context, the total loans to Latin America in the 1980s banking crisis was under $200bn loaned to 15 countries with a population of 600mn. They paid it back, give or take. The population of Greece is 10mn. Every Greek man, woman, and child should be sitting on $40,000. But many of them are hungry or worse, out of work, facing a daily invasion of thousands of war refugees from the Middle East. It was just 25 and a bit years ago that Communism and the Berlin Wall collapsed. The capitalist West had won a 70-year confrontation. Good had vanquished Bad. Christian values had emerged as the dominant, indeed the only, world scheme. If it was not Christian, it was a first cousin, Liberal Democracy, the rule of law. When the Berlin Wall fell in 1989, Peru was a failing nation, as is today, for instance, Venezuela. The government was collapsing, terrucos and cocaine cartels seemed to be taking over. Peruvians had to carry their money in shopping bags, wheelbarrows even. A quarter of a century later, Peru is a liberal democracy with a solid financial system. It meets its international obligations. It has a lively line in corruption. But its best efforts are a modest, tropical shadow of the German and Swiss corporations, which have set out to cheat their customers and stakeholders. The failed nation of 1989 has had elections every five years, since 1980 with a whoops to bring in the new millennium. In six months there will be another election. And another again, it’s reasonable to expect, in 2021. This is not to say that Peru does not have a long way to go. Nor that the Germans and the Swiss are not thoroughly good people, world leaders in all sorts of valuable ways. Many Peruvians would understandably harumph! at the “rule of law” clause that necessarily goes with liberal democracy. But just this week the Constitutional Tribunal with an occasionally fuzzy record, cracked down decisively on an attempt by Nadine Heredia, President Humala’s wife, to slide past due process with openly inappropriate legal maneuvers. Instead of skirting the issue the Tribunal quickly, decisively, cleanly blew the whistle on the lively Sra. Humala and stopped her efforts to avoid investigation by the courts into her colorful financial history. It may be that the Tribunal will have done her a favor and that her financial doings may be less than meets the eye. But the point is that Peru has shown that when push comes to shove, as it certainly did in this case, the system has proven to be not only better than expected by most, but getting better than it used to be. The World Bank/IMF meeting in Lima this coming week is the biggest, most prestigious get-together of the year for bankers and finance people. Anyone who is anyone from anywhere will be here, has to be here, and it is a great thing, for Peru. It puts the country firmly, perhaps a little unexpectedly, on the list of world centers, up there with Rio and Mexico City. Peru’s finances and politics will take little of the attention of the ten or twelve thousand financiers and camp followers. But the reputation of Peru’s cuisine will fill the restaurants in Miraflores and San Isidro from midday to after midnight. Many of the visitors will want to take in Cusco and Machu Picchu. Good news as it reflects, as with the restaurants, the arrival of first-rate hotel and airline service, a true hospitality industry that did not exist even a decade ago. The priority of the ministers, the central bankers and their aides will be to get a fix on what is happening to the world economy. They will be looking with increasing concern for guidance, ideas about what to do, once they get home. Not since the Lehman explosion in 2008 have government finance people in the emerging countries had to face the certainty of falling prices, falling production, falling employment and falling income. Worldwide, only a small handful of countries — starting with India and the United States— is growing. Not much but at least moving forward. Europe and Japan are stagnant, with no immediate prospects of growth as are usually reliable heavyweights like Canada, Australia, and the Scandinavians. This group includes as respectable tail-enders Peru and Chile, Mexico and Colombia, Singapore and Indonesia with, as it may be, Iran about to join in. The rest, led by Brazil, China, Russia, Turkey, and South Africa, not to mention the Middle East and Africa, are in recession or in open disaster. The delegations from 150-odd countries members of the IMF and/or the World Bank will be hoping to bump into someone, perhaps from the international investment and commercial banks, who can give them ideas about how best to keep afloat for, it has become clear, at least the rest of the decade. This used to be the job of the IMF and of the World Bank. Not so long ago the World Bank was the main inspiration for public works and infrastructure for Latin America and elsewhere. It was a full-service institution, much more than a bank, providing moral backing as well as technical expertise, funds and guarantees. The IMF, a similar building of conference halls and honeycombs of offices across M St in downtown DC, provided emergency funds and financial backbone for governments in problems. This included big names like the United Kingdom, not just third world backsliders. It may be that many of the World Bank projects did not work as advertised. Certainly the IMF’s austerity demands often produced pain with little immediate gain. Europe, including Greece today, are inheritors of this tradition. But the notion that orderly public finances and statistics are a good idea and not just an imperialist plot has become standard issue to the enormous benefit of countries round the world, starting with Peru and in this often-bolshie neighborhood, Chile, Colombia, Bolivia, Panama, Costa Rica, and Mexico. It also included during the 1990s and the early years of this century, Brazil as star pupil. But this year Brazil has become an 800-pound gorilla. At this Lima meeting it is not China that has already joined the other elephants like Japan and Europe, but Brazil that will be a feature of concerned conversation. A couple of years ago Brazil had become the world’s seventh biggest economy, a few pounds ahead even of the United Kingdom, a century ago the world’s greatest. Until earlier this year it seemed to the financial markets as though Brazil could treat the commodities slump like a road-repair diversion. It could have been thus. Instead, “We got hit by a turtle,” a disgusted Sao Paulo executive told the Wall St Journal this week. Brazil is turning into an international mega-problem. It is not just that Brazil’s public finances are in tatters. . . Infrastructure like roads and water supply is in deep disarray, with crime rising. National and regional politics, traditionally complex, are disintegrating with the opposition as weak as the government itself. These days this is not just another colorful third world sad story but one that could detonate a run on the international credit markets This week here in Lima the single biggest topic of discussion will be how to prevent or at least postpone a Brazil debt default. Not so long ago it was the IMF that could put out the fire. But today the credit markets are huge and unstable. The money that has gone, virtually uncontrolled to companies in Brazil, China, Turkey, and South Africa went often into ventures that do not work, often mines and hydrocarbons facilities which themselves have created today’s low prices. It is no accident that the copper price has moved below its 200-month moving average, setting the tone, too, for the other industrial commodities. At the beginning of the week, the bonds and other debt issued by Glencore Mining dropped along with its share price by 30%. Glencore, with a long association with Peru through Xstrata and Marc Rich, developer of the massive Antamina and Las Bambas copper mines here, saw its market value at $16bn, down from $80bn earllier in the year, and its debt at just under $50bn — huge numbers and huge dislocation. Other mining and hydrocarbons companies, including BHP Billiton and Anglo American, are developing the same kind of dislocation between the productive value of their assets and their ability to service the debt paper bought with enthusiasm not long ago by investment and retirement funds in Europe and the United States. Top of the list are Petrobras and Vale do Rio Doce. Petrobras debt today is, at $470bn, 10 times greater than Glencore, one of the world’s biggest. Wall St analysts say they have always assumed that the Petrobras debt is backed by the government, but famously Brazil’s sovereign debt has itself been marked down by the rating agencies to junk. By coincidence, the foreign debt of Greece is within a dollar or two of Petrobras’ obligations. In the case of Greece, of course, every widow’s mite is going to be picked up by the German taxpayer. These are just straws in the IMF and World Bank’s headwinds this week though, there’s plenty more of the same. For instance the IMF itself has published a report saying that $18 trillion — i.e. $18,000,000 billion, give or take— in bonds and similar have been issued by companies in China, Brazil, Turkey, up from $4 trillion in 2004, and warns that a lot of this is held by US mutual funds. This in turn is part of the $60 trillion in debt that has been issued worldwide as of 2009, over and above whatever it had been before that. This is the context of the IMF/World Bank meeting here this week. If economies around the world were growing as they did from 2009, then lenders and investors could as usual suspend their disbelief. But the IMF itself has said that it will be lowering, again, its growth forecasts for the coming few years so the lack of connection between reality and the credit markets has become even clearer, China or no China. For sure the tip-top bankers and economists, investors and traders here are aware, convinced in fact, that it is them and not the elected politicians who are in charge What sets the annual IMF/WB meeting apart is that there is more to it than just international bureaucrats, paper-pushing government officials and the blank-eyed economists and lawyers who run central banks. The juice, and the big money, for this meeting comes from the investment and commercial bankers from Wall St., London, Frankfurt, Toronto, Tokyo, Sao Paulo who come to meet each other as well as government officials. The meetings take place at dozens of cocktail parties, buffet breakfasts and lunches and, naturally, cups of coffee and drinks at the bar. Lima’s main banks, the Credito, Interbank, the BBVA Continental, and Scotiabank are putting on big shows. Two out of every three years the WB/IMF meeting is held in Washington itself where there is a well-oiled hospitality industry. Traffic is a known quantity. The hotels are geared to big-name conferences. It is easy to get things done. Phones and taxicabs work. Then one in every three years the meeting is held away from home. It might be somewhere well-organized like Berlin. Or Bankok or Lima with dreadful traffic and security worries. Lima is more of an adventure but that adds spice. There will be real interest for the participants in the Prospects for Peru as an up-and-coming junior BRIC. The collapse of Brazil, joining Argentina and Venezuela, means that Peru, Chile and Colombia will have a chance to shine, to provide, along with Mexico, the main positive focus in Latin America, a valuable door-opener for the coming decade. I have a suggestion for Mr. Castilla, the young finance minister, which will help him iron out what he calls disruptions in the economic agenda. It happens to us all. My idea is that he create a new tax which will have the merit of aggravating, but not much, the better-off, and pleasing socialists, making it an out-of-the-gate winner. My proposal is for a tax on windows. If, like some of my neighbours here in Urubamba, your house has just a few small ones or, high in the Cordillera, no windows at all, you pay nothing. If your house in the jungle is all palm-thatch roof, it’s the same. No tax. For Peru today, the window tax is “Brilliant!” says Richard Webb, the country’s top economist. Every householder will simply fill in a form on their iPad stating the number of windows in their houses and apartments and make a bank transfer accordingly. The tax people will of course make spot checks and anyone whose math is found faulty will pay a suitable fine. Jane’s reference to the window tax comes as she is describing the visit of a family to the immense country palazzo of a neighbour where there were so many rooms that their only function, she suggests in her sharp-tongued way, is that they are there to pay the window tax. All English people, like myself, are familiar not only with Jane’s stories but also with the window tax of the 18th and 19th centuries, partly because its results can still be seen in old towns and old houses out in the country. Some of these still have large window-spaces blocked in with bricks in order to reduce the owner’s tax liability. My 1911 Encyclopedia Britannica tells us that the tax was widely disliked as an attack on “light and air” but was acknowledged to be progressive, meaning that it hit the rich but not the poor. If your house had more than eight windows you had to pay double the rate, to whit, four shillings per window instead of just two shillings. H.M. Treasury’s website calculation of what two shillings would be in today’s sad sterling is just over GBP11. That’s $17 per small-house window, call it S/.50, or S/.100 per window for a house or apartment with more than eight windows. Let’s say there are five million urban houses in Peru with six windows apiece, the window tax would bring in $500mn at practically zero cost in collecting. There would have to be some clear definitions. For instance, my own house here in Urubamba has 14 windows, plus six in the playroom and guest suite on the other side of the garden. But two of them on the verandah are absolutely immense, making up a full 20 yards long looking onto the river, the woodland and the snow peaks of the Cordillera Urubamba. If I had to pay, say S/.300 a year just for those, I’d think, at S/.1 per day not including Sundays, that I was getting a good deal, cheap at the price. The tax, the encyclopedia says, was also levied in parts of France and Germany. In England it was ended in 1851, maybe because in those days it was not so easy for the Inland Revenue to collect from crusty landowners with bulldogs and shotguns. Urban property is undoubtedly the biggest, least taxed, yet easiest to tax, and most justifiably taxable form of wealth in Peru. Justifiably because there is zero disincentive on productive activity, and because it is highly progressive and by any standards democratic. Here’s a back-of-the-envelope calculation. Let’s say there are three categories of urban – district capitals, medium cities, and Lima. For the districts we have a figure for the last 10 years, using my telephone survey of 200 of the smallest and poorest district capitals. If the average size of those homes is 100 square meters, the square meter has risen in value from US$11 to US$43 between 2001 and 2010. For medium towns we can guess that the square meter value is about double the distrito value, therefore rising from US$22 to US$86. For Lima, a house in the grass-roots Huascar area, in San Juan de Lurigancho, today sells for about US$200/m2, up from US$51 10 years ago. Excluding rural homes, the urban population is roughly 30% Lima, 20% medium cities, 20% distritos. So, multiplying the values by the homes (average family is 4.5 persons and two-thirds live in owner-occupied homes), we estimate that total home value has risen from US$8 billion to US$38 billion between 2001 and 2010. Back in 1960, it could not have been much more than US$1 billion. If the window tax is the equivalent of an annual 1.2% tax on house value, I arrive at almost exactly your estimate of US$500 million annual revenue. And all on wealth that no one produced: it is pure rent generated by the fact that it is more practical, productive and socially pleasant to live nearer other people than scattered all over the mountainside. I also asked Richard, about the values of agricultural land, nothing to do with windows. “I thought you’d never ask,” he said. “Our survey included a question on “el precio de una hectarea agricola en su distrito.” I’ll check, but off the top of my head the preliminary figures, when the survey had reached 100 districts, changed only slightly when we extended it to 200. With polling day on October 3 the campaigns for regional and municipal elections are heating up and this is not just a spectator sport in Peru. 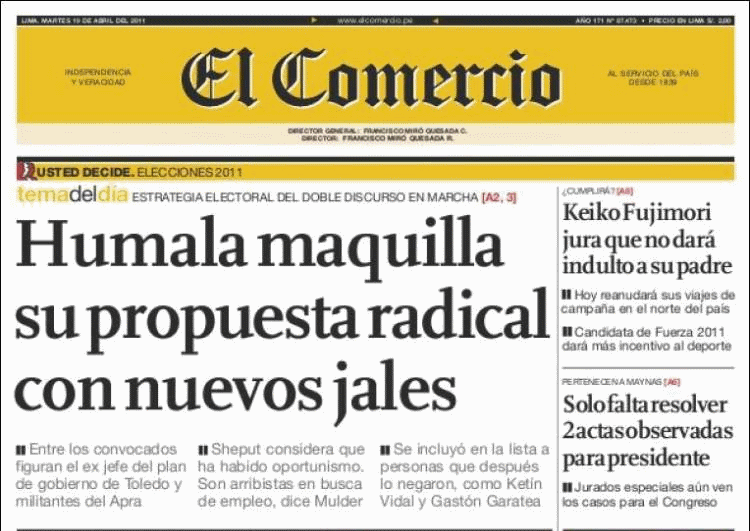 Hundreds of people in every district, thousands in every province are running for office and to judge by Urubamba, Cuzco and Lima, which I follow with attention, the democracy-count runs the gamut from vicious to ferocious. Half-a-dozen candidates have been murdered, one would-be alcalde in the backwoods of Huanuco is in jail for organizing a who-can-drink-most competition with wood-alcohol at which the three winners died, and the alcaldesa of Santa Anita, a Lima district which includes a main foodstuffs wholesale market, escaped when her car was fire-bombed. There are even aviation connections. In Lima the front-runners are Lourdes Flores, on my Right, and Alex Kourie, in the misty Middle. Lourdes, a 50-something lawyer, has run for President of the Republic two or three times and had always seemed to me to be jolly, too talkative but nice. Few, including me, now think this because the TV and newspapers have forced her to own up to working for years for a fellow called Cataño whose name is really something else but he changed after being nabbed years ago with 100 kilos of cocaine. 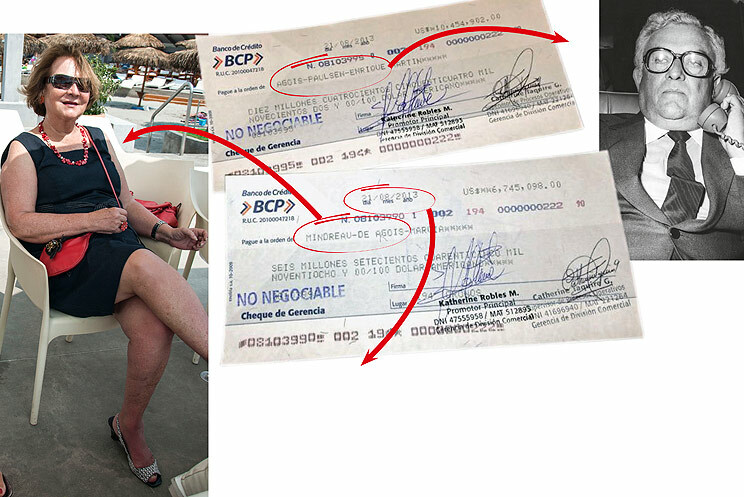 Lourdes has for some time been Chairman of Peruvian Airlines, owned by Mr. Cataño, at $10,000 a month plus exes. 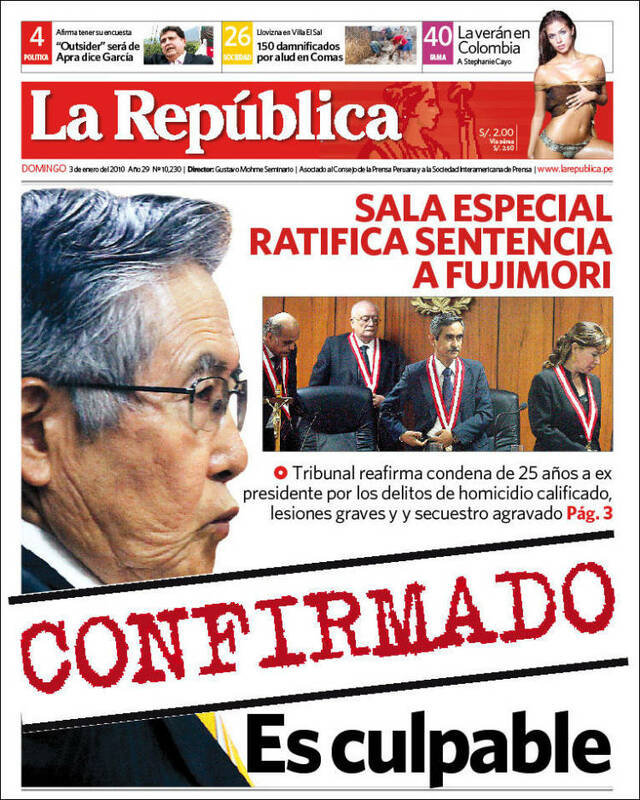 Lourdes also does not chat freely about another client and friend, Jose Luis Sanchez, the Spanish spinner who collected $3mn from Fujimori’s master-fixer Vladimiro Montesinos, now doing life in a Callao prison, during the 2000 general elections. Sanchez was in charge of the dirty tricks section. Lourdes has also been legal advisor to the people, many of them from Pakistan, who import tens of thousands of second-hand cars, trucks and buses from SE Asia to come and gasp their last smoky, fumy breath on Lima’s clogged streets. Many of them, to add injury to insult, started off as right-hand drives from Japan, Hong Kong and the conversion to left-handers is often poorly done meaning dreadful crashes and buses going over Andean precipices. It’s all illegal, but Lourdes has shown the importers how to get local magistrates to slap amparos, laissez-passez orders thus circumventing the laws. Mr. Cataño, though not from Pakistan, is also a leading importer of pre-owned vehicles and the drugs police are pressing him for details on his finances. Alex Kourie, mayor of Callao, has had problems with a tiny one-mile section of the only road to Lima’s Jorge Chavez International Airport where he was charging a $1 toll; for years it was easily the most profitable venture in town, making infinitely better margins than LAN, COPA and TACA combined. An unfancied outsider, Susana Villaran, has come up fast on the loopy Left. Susana, one of those expensively-brought-up caviar socialists, as they’re known in Lima, has a collection of convicted terrorists on her aldermanic lists and spat furiously at my friend Pedro Pablo Kuczynski, the banker and former PM, when he mildly commented that foreign investors were “keeping an eye on”–some such– her swift rise in the polls. The present mayor of Lima, Luis Castañeda, a close associate of Lourdes, is running for President in next year’s elections, but has been dogged by connections with a $20mn scam involving garbage collection and some Brazilians. For us in the provinces this is all entry-level shenanigans. At the moment the mayor of Cuzco is the third since the elections four years ago. The first two achieved the impossible by getting caught with their fingers in the cookie jar. The way that crooked alcaldes actually get caught, though rarely, is what is politely known as nepotism; no one can resist having their cousins, children, domestic servants and mum and dad on the payroll. Actually, none of the voters objects -they’d do the same; noblesse oblige. But they only get accused of it when there are more serious matters that can’t so easily be proven. Benizio has the backing of the well-heeled Hugo Chavez —come in, Caracas--party, whose symbol is a simple “O” for Ollanta Humala, an ex-army commandante and wanna-be Chavez whose wife has problems explaining where all her money comes from. On top of that Benizio has the support of the Machu Picchu bus drivers, to whom he awarded a 30-year monopoly, worth $10mn+ a year for 20 creaky buses between the train station and the ruins. This is totally, believe me, illegal but Machu Picchu is a no-rules zone, off-limits even for SUNAT, Peru’s tough IRS. There are 13 candidates for Urubamba mayor and it’s not only Caracas and the bus people but the government budget that makes it worthwhile. Eduardo Guevara, a three-time mayor here, and a good friend, tells me that in his day it was a million or two. Now it’s $20mn. Eduardo, who’s running again, was round for a coffee the other day together with a candidate for mayor of one of our districts, a Catholic priest, an excellent young chap who we’ll call Arturo. As we were talking, I found that a lady had come in and was physically attacking Padre Arturo, spitting, hitting, swearing. It was a comadre of mine, a schoolteacher and it turned out that Arturo was the father of her one-year-old baby, a frequent visitor but we’d never been told and, of course, never asked about daddy. But there I was, like one of those referees in a wrestling match on the telly, trying to separate the contenders. Naturally, my comadre’s family is running one of her many brothers, also a good egg, for the alcaldia of the district against Padre Arturo. Try as one may it’s not easy to stay out of local politics and now you see what I mean about it being not just a spectator sport. Ferocious blizzards in the United States, a warm North Pole, biblical floods in Queensland and drought in northern China are being blamed on La Niña but here in Urubamba in the permanent eye, one supposes, of the Niño+Niña complex, the weather could not be more charming. The shock pre-Niña rains a year ago which cut away big slices of the railway to Machu Picchu, have been followed this year by the traditional monsoon mixture of warm sunshine and refreshing rainfall. It’s sparkling, green and friendly, our favourite time of the year. We sense some of the mystery of the carefully-sculpted Cloud Kingdom of the Incas where dramatically chiseled rock walls controlled the rivers, the fields and the ciudadelas. The first El Niño that gave Peru a headline role in the world’s climate drama occurred four decades ago in 1972. Newspapers worldwide published little maps showing Peru with arrows going in all directions. My sister Anna, an international skier, complained that Peru’s desert rainstorms were ruining the snow in the Swiss Alps – globalization avant le mot. That Niño had been preceded in Peru by a famously remorseless anchoveta hunt by the brash new Peru fishing fleet led by the engaging, brilliant Lucho Banchero. Every single anchoveta from the beach breaks to the whale belt 100 miles offshore was netted. Boats would capsize and sink with too much fish. The catch was 12 million tons, one in every five fish caught worldwide that year. The Apus struck back instantly and implacably. The dense horizon-to-horizon clouds of seabirds, the world’s greatest, have never returned. In Lima we watched thousands of starving pelicans fight for their last scraps outside the Surquillo market. The price of fishmeal, corn, wheat, sugar, cotton and soya skyrocketed on the New York and Chicago markets. Serendipitously perhaps, OPEC doubled and tripled the price of oil to $15 the barrel. I myself moved the market. I reported to McGraw-Hill’s commodities wire on the strength of a good-humoured tip from the U.S. Embassy, then literally a stone’s throw away on Av Washington, that Arabs had come to Lima to buy copper. I practically had them mounting their camels in flowing robes at the door of the Hotel Bolivar before riding down La Colmena. The Chicago Board of Trade copper price jumped from 60 to 70 cents the pound but I was too young and poor to take advantage. In any case I had just come from Fleet St where you learn on Day One never to believe your own story. Thus the first post-WWII price crisis. Nixon had de-pegged the dollar from gold. The oil people had no idea what to do with their billions –before that a million or two was real money– and gave it to Citibank who lent it to obscure states that even Brazilians hadn’t heard of, to Peronist bag-men and soldiers in Buenos Aires and to the Banco Popular in Peru. Six hyper-crises later here we are again. Hundred-degree heat scorched the wheat crop last year in Russia and the Ukraine, The same economists who six months ago were gasping deflation are now fighting inflation by, of all things, reducing taxes. So even here in Urubamba we all know that bumbling bankers, confused bureaucrats and a cascade of Niños and Niñas have packaged themselves into a global roller-coaster, though I bet that in the Andes we’re safer than anywhere else. Here in any case is where we stand, broad-brush, in the southern Sierra. Four decades of figures from Senamhi, the weather bureau, show an average increase of between two and three degrees centigrade -the figures themselves are precise but it depends on the location. This is a lot. The glaciers from the Vilcabamba south to the Cordillera Real above La Paz and Lake Titicaca have all but disappeared. All you’re looking at now is a dusting of snow. The remains of old airplanes that crashed into the ice fields 30 and more years ago are being uncovered, frozen bodies of young pilots recovered and buried by their families. A few hundred miles to the east the Brazilians continue mowing down the Amazon and Sertao, unthinkable even as recently as the 1972 widescreen Niño. Average rainfall here has lessened, too, though the overall figures aren’t startling. But the rain now tends to come in sharp bursts, meaning there’s a lot less for farmers. “We’re having to undo the work of decades where European NGOs brought in big, expensive cows and thirsty crops like alfalfa to feed them. Now there’s not enough water,” a Ministry of the Environment official in Cuzco tells me. As you might imagine, the Incas had it all clear. Their huge high-altitude polylepis –queuña— forests, now largely cut down for firewood, conserved water. Their great flights of terrace complexes made best use of it.